Our top-priority is keeping Panorama and Country Hills residents informed. All the community’s must-know news is easily accessible through the Panorama and Country Hills community newsletter, which is published monthly so that residents are kept current on relevant community and Calgary news. 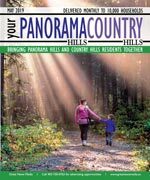 Your Panorama Country Hills is delivered monthly to every household, apartment, and business, and is a great way to get hyper local advertising exposure. The Northern Hills Community Association consists of the communities of Harvest Hills, Coventry Hills, Country Hills Estates, Panorama Hills Estates, Country Hills and Panorama Hills. These communities are all new developments and are located in the city’s northwest. There are several golf courses in the area, as well as numerous restaurants, shopping facilities and a theatre. Two historical sites, the Reverend George McDougall Cairn and the John A. Lewis Rock Quarry are located in Panorama. Residents of Northern Hills can access the Nose Creek Valley and the West Nose Creek Valley. LRT extensions to this area are planned. Northern Hills is home to numerous public and separate schools. The Northern Hills community association office is located in the Genstar wing of Cardel Place. As the community association for a rapidly developing community, the association is primarily concerned with urban planning and development proposals. The association also offers sports programming for local residents, including soccer. Cardel Place, operated by the Nose Creek Sports and Recreation Committee, opened in 2004. The centre includes 2 skating rinks, 3 gymnasiums, an aquatic complex, climbing wall, and workout area. It also houses the Calgary Public Library. The association also publishs a monthly newsletter for local residents. In the City of Calgary’s 2012 municipal census, Panorama Hills had a population of 22,247 living in 7,398 dwellings, a 12.1% increase from its 2011 population of 19,851. With a land area of 6.3 km2 (2.4 sq mi), it had a population density of 3,531/km2 (9,150/sq mi) in 2012. Residents in this community had a median household income of $89,044 in 2005, and there were 5.2% low income residents living in the neighbourhood. As of 2006, 41.7% of the residents were immigrants. Most buildings are single-family detached homes, and 2.3% of the housing was used for renting. For more detailed info visit the City of Calgary community profiles site.